The following describes a program for recreational U4-U19 players throughout the Metro Tulsa area to promote the game of soccer and a healthy lifestyle, team spirit and life lessons to those youth athletes with special needs. 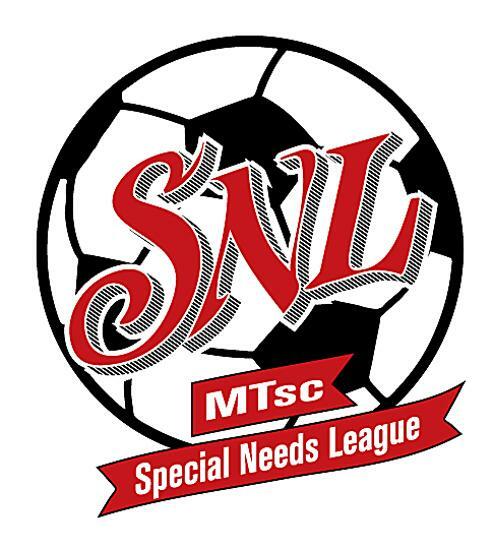 The below characteristics define the MTsc United Special Needs League (SNL) Program. 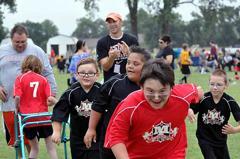 The SNL Program focuses on the development of youth players who have special needs. Modified rules of soccer are applied by paid officials during games to allow for engagement and participation by all players and also to allow coaches to ensure on the field player success. All players are assigned to teams based on observed capability, engagement via a collaborative process between parent coaches facilitated by MTsc U and based on guidelines established by MTsc U for the SNL Program. Each team has parent volunteer coaches (1 head coach and 1 assistant coach). One practice a week is held at a common location for all SNL teams. 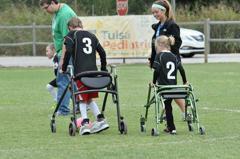 Team uniforms must be worn on game days and MTsc U Buddies assist on the field during the games as needed. Each season, 8 games are played during Saturday of each soccer season (spring and fall). A special team photo day is set up for SNL players for both individual and team photos and all participants are eligible to receive a participation trophy at the end of the season. 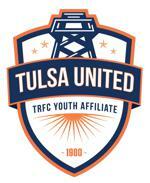 All games and practices are conducted outside on the north side of the MTsc United SoccerPlex in south Tulsa. Open to 4 year olds through 18 year old youth athletes from ANY school district with special needs (physical or developmental disabilities). MTsc U participation is non-geographically tied. Specific birth date cut-offs for 4 and 18 year olds are automatically determined by the MTsc U online registration per the governing body US Club Soccer and US Soccer. The focus is on player participation and success, fundamental movements of soccer, appreciation for the game, team friendships and fun. For a detailed description of the Program itself check out “MTsc U SNL Program Content" PDF at the bottom of the page. A volunteer parent staff makeup the Program’s coaches, who are subject to Club acceptance and are required to be either Club certified or state licensed. An In-House Certification program is available before each soccer season for the cost of $5 to assist with material costs. Organized leagues with 7 to 8 games each season (subject to division size). Games are on Saturdays at the same location as weekly practices as noted below. Seasonal SNL subsidized Registration Fee regardless of age is $43.00 (the subsidy is provided by MTsc U of $40 to $42 which is the difference between the Recreational/Friendship League Registration Fee and the SNL Registration Fee depending on the age of the player). A late fee of $19.00 is added to registrations after the date noted on the Calendar of Events consistent with all non-competitive league registrants. 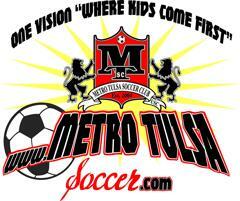 Register online using the “Online Registration” link on the home page of www.MetroTulsaSoccer.com. Accepted forms of payment include MasterCard or Visa credit or debit cards, Discover Card and e-Checks. At MTsc United, each age bracket uses one of four different uniform color combinations consisting of: red, white, black and/or royal blue. See the Uniform Policy on the website. All uniforms cost the same fee, due at registration: $39.00 for all SNL and REC/FT players. The uniform program is designed to allow a continuously registering player to use his/her uniform for up to 2 years* before being required to purchase a new uniform. Uniform sizes are selected during online registration and those sizes will be ordered. Samples are available for sizing at Mac’s Soccer Shack. Re-orders due to incorrect size will be at the parents' expense. * 2 years is based on a player remaining in the MTsc U SNL program for 4 consecutive seasons beginning as a U5, U7, U9 or U11 player thus a RETURNING player. As each odd number bracket a new uniform must be purchased in addition to if a player is considered NEW which means they did not play at MTsc U during the prior season. Practices are held on Friday nights of each week during the above seasonal periods and start at 5:30 p.m. to potentially earlier due to daylight savings later in the fall season. Practice sessions are held at the MTsc United South located at 10715 S. Delaware Ave. in south Tulsa on the north complex on field 7A-7G. Note: Relative to practice your specific coach will be the person responsible for communication. For questions as to how generally the Program works, registration for the Program as well as Program content, contact MTsc U at 918-298-0190 or send an email to MTscParentsOnly@att.net including your name and phone number. Alternatively look at the Contact Us page for the Program Coordinator contact information. ©2019 Metro Tulsa Soccer Club / SportsEngine. All Rights Reserved.